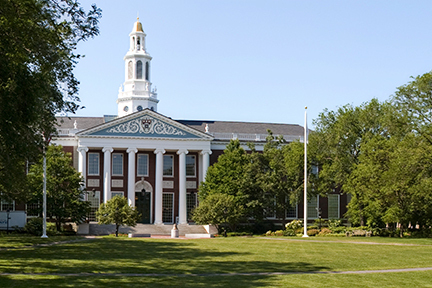 By virtue of its immersion in the case method, the richness of its section life, and the depth and breadth of its extracurricular activities, the HBS MBA Program is best appreciated through direct experience. If you are interested in applying, we encourage you to visit our campus (but please note a visit to campus is not required or expected). In addition to in-person visits, you also have many opportunities to engage with students, alumni, and admissions staff; please check our schedule of online and in person outreach events around the world. For many of our students, the excitement, energy and unexpected insights generated by case method education make it unlike anything they have experienced before. We invite you to learn about the academic environment at HBS by observing a class in session. Registration is now available for class visits beginning on Tuesday, January 29th. Class visits will be available through Friday, April 26th. Please use this link to view the class visit schedule and to register for a class visit. Due to the number of visit requests we receive, you may only schedule one class visit through the MBA Admissions Office. You may select the class visit time, but not the specific course to observe. During your visit to our campus, we are happy to help with disability accommodation requests so you can fully engage in the HBS experience. You must be registered to attend a class. We cannot accommodate walk-in or stand-by visitors and we do not maintain a waitlist for class visits. Visitors need to report to the MBA Admissions Office in Dillon House to get their class assignment. You MUST arrive a minimum of fifteen minutes before your scheduled class time. HBS classes always start on time and students and visitors must be seated before class begins. If you do not arrive early, we will cancel your visit. You must be 18 or older to visit a class. Campus tours are available on most Mondays and Fridays throughout the year. Please see the exact dates and times when tours will be offered as well as where to meet on campus prior to the tour. The Admissions Office also hosts group information sessions on most Mondays and Fridays throughout the year following campus tours. Group information sessions are primarily Q&A based; please review the MBA Program and MBA Admissions presentations in advance and come with questions. When planning your visit to campus, we suggest you make time to join both the campus tour and the information session together. Please see exact dates, times and locations for information sessions. Registration is not required, but is strongly suggested, for campus tours and information sessions. These activities will not be held when the Admissions Office is closed. Each year around 25 student organized clubs host their annual conferences on the HBS campus. If you are planning a visit to the HBS campus while classes are in session, we encourage you to check out the list of conferences in advance and potentially plan your visit at the same time as a conference of your interest. The conferences require advanced registration (including a registration fee). For instructions on getting to HBS, parking information, and a map of campus click here.